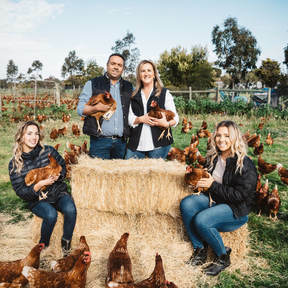 On behalf of my loving husband Alan and daughters Pantelitsa (Pandy) and Meranda we would like to welcome you to Sth Gippsland Eggs - our free range egg farm, located in Devon Meadows, Victoria. Thank you in advance for all your loyalty and support over the years! For those of you that don’t know me, I’m a loving mum, terrific wife & second generation free-range egg farmer! I love the farm life, with my first ever memories being of horses, hens, sheep, goats and cattle. Have enjoyed a life that’s been full of horses, hens and all the other amazing stuff that farm life has to offer. Welcome again, from the whole family to our website! A celebration of 3 generations that have lived, worked, played, laughed and cried on the family farm for what will be 50 years in 2019! Take a look around and be sure to send us a message if you’d like to know more about our hens, free range eggs and humble farm! Mum & dad never pushed us into being free range egg farmers! They made a great living & led an awesome but tough life on the farm! But in 1999, after I finished an Accounting degree at Uni, my husband Alan and I had a vision!!!!! With the support of my parents, Alan & I decided to convert our caged egg farm to a free range egg farm. There’s been lots of hard work, blood sweat & tears over the past 20 years, especially from Alan who has worked tirelessly on the farm. With lots of support from our staff & until late 2017, the invaluable guidance & hands on support of my late father Peter, it’s been a memorable, fun and very rewarding journey in many ways. In 2019 our adventure will be a 50-year farming story that we’d now love to share with you! "Happy, healthy hens lay the most delicious & wholesome eggs." Don't take our word for it, click below and have a read of what one of our happy customers had to say. 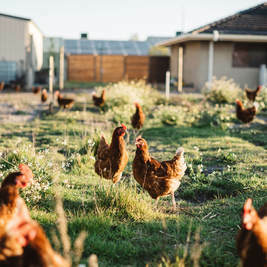 ​When Alan & I launched our Sth Gippsland free range eggs brand almost 20 years ago, we never imagined that our humble beginnings would lead us to where we are today. 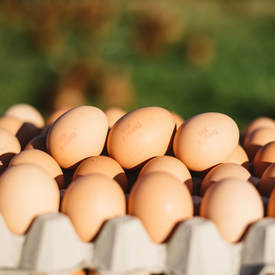 20 years ago you’d only find our eggs in Farmer’s Markets and at a few independent quality grocers. These days, you’ll find our Sth Gippsland Free Range Eggs at independent grocers and supermarkets across Victoria. Click the link below & find out more about the full range of products that we offer.